Welcome to the Victorian Resources Online West Gippsland site. 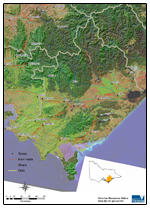 This is your gateway to a wide range of resource information for the West Gippsland catchment management region. The West Gippsland region covers some 17 164 square kilometres - representing almost 8 % of Victoria's total area. Oblique aerial overview of West Gippsland catchment management region showing towns, major roads, rivers and major landform features and land use.